The timeline track headers as of Kdenlive 16.08 now show status LEDs. But what exactly do these LEDs signal? Or are they just rag? LED is off: this track is a plain simple track. It is neither locked nor is any audio muted or video hidden. And it isn’t a target track; more on this in a few seconds. Red LED: this track is locked. In addition, the track background turns to a reddish-brownish color. You can lock and unlock individual tracks using the lock icon of the particular track. In the screenshot, the topmost track titled Corp Logo is locked. The shortcut Shift+L also locks and unlocks the currently selected track. This is the track with the bluish background color; in the screenshot Talking Head is the currently selected track. Yellow LED: either audio is muted or video is hidden, or both. If you lock a track, then red takes precedence. track Blackground is the video target track. track Talking Head is the audio target track. Please note that the new advanced editing functions insert and overwrite don’t use the currently selected track as soon as splitting audio from video is enabled. Instead, the target tracks take over. 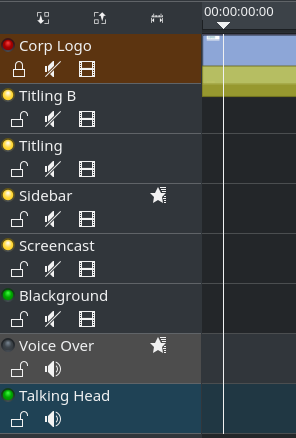 Remember that you can enable and disable audio/video splitting at any time from the Kdenlive status bar. Simply click on the status bar icon that is shown left.